A Roman Catholic church official was sent back to prison Thursday after the Pennsylvania State Supreme Court reinstated his 2012 child endangerment conviction over his handling of priest sexual abuse complaints. Monsignor William Lynn, the longtime secretary for clergy at the Philadelphia archdiocese, is the first U.S. church official ever prosecuted or convicted in the clergy abuse scandal. A judge on Thursday agreed that Lynn's case presented a "novel" issue that she could have gotten wrong when she sent the case to trial: the question of whether Lynn actually "supervised" children under the law in 1998, when the boy at issue in Lynn's case was molested by a parish priest. But in a case full of twists and turns, the state Supreme Court this week said he did and called his conviction legal. So after 18 months in prison and 16 months on house arrest at a city rectory, the 64-year-old Lynn — wearing jeans and a gray sweatshirt instead of his usual black shirt and collar — found himself back before Common Pleas Judge M. Teresa Sarmina. 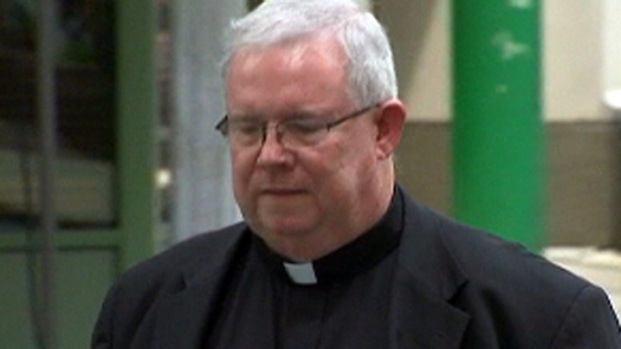 Former secretary of clergy for the archdiocese of Philadelphia Monsignor William Lynn is back in jail after a court overturned the decision to throw out his conviction. The issues raised in Lynn's case have entangled prosecutors, defense lawyers and at least 10 Pennsylvania judges since 2005, when the city's top prosecutor blasted the archdiocese after a grand jury investigation into 63 accused priests but concluded the law applied only to parents and caregivers. A new prosecutor felt differently and in 2011 brought charges against Lynn but not against longtime Philadelphia Cardinal Anthony Bevilacqua, who died in 2012. Lynn had served half his minimum three-year sentence when the state Superior Court threw out his conviction in December 2013 and ordered him released. But the state Supreme Court reversed that decision in the 4-1 opinion Monday. "His conviction's back in. He should go back in," trial prosecutor Patrick Blessington argued Thursday to Sarmina, who had presided over his three-month trial. She had allowed the jury to hear weeks of agonizing testimony from adults who said they were sexually assaulted by Philadelphia priests to show what prosecutors said was the church's pattern of transferring predators to unsuspecting parishes and hiding complaints in locked files. Lynn had control of those "secret archives" and perhaps wanted to address the brewing crisis, Sarmina found. But he stood silent when Bevilacqua had his list of known and suspected predator priests destroyed. Defense lawyers will now challenge other aspects of his trial, especially Sarmina's decision to let about 20 other church accusers testify about abuse they said they suffered decades ago when their allegations were not directly part of the case. The conviction involved only Lynn's oversight of the Rev. Edward Avery, who admitted assaulting an altar boy at a northeast Philadelphia parish where he landed after earlier complaints about his relationship with another boy. "There are enough unusual issues in this case (that Lynn) ultimately could be exonerated, and he'll have done his whole sentence," defense lawyer Alan Tauber, one of Lynn's trial lawyers, said as Lynn was handcuffed and taken into custody.